You cannot add the factory style, which requires drilling into the roof because of the air bags. You have to use the clamp on ones, from what I was told. how bout track mounts? no landing pads huh? that will keep the rooflines from being fouled by plastic stips of blobs if that is the case. I could use the racks, but hate clamps and what they have done to paint in the past. Click on photo to blow it up. Edited by DozerBob, 04 February 2013 - 05:53 PM. I looked at the roof rails, and they don't match the install instructions for rail mounts. I imagine there are going to be, with most cars, a lot of third party accessories that require some kind of manipulation to the car to install. Personally I'd rather wait for something more legit or not at all. Should be able to install track mounts or landing pads on Non-Moon Maxes if you don't mine fuglying up your roofline. I have the moon roof version with Thule rack. Fits great but loading it is a little unnerving with all that glass below. Actually I would expect that moon roof glass to be a better support than the sheet metal they used these days... unless you have a really huge load? Edited by jeffegg2, 13 June 2013 - 10:42 AM. Thule rack, surf pads, moon roof. All works great. 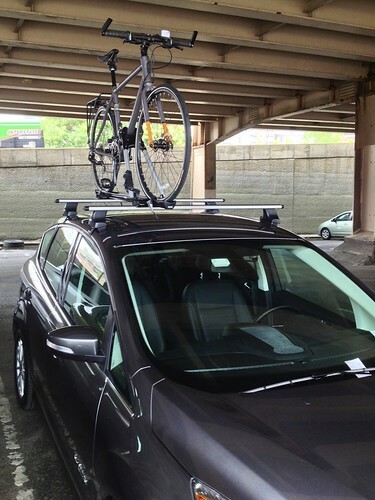 I just installed the Thule Aero rails and a Thule 599XTR Big Mouth Upright Rooftop Bicycle Carrier. It was relatively easy and seems very secure. Sadly Amazon.com's shipping gang dented the rails but they seem to work just fine. Edited by tomarthur, 09 August 2013 - 04:14 PM. so, getting that bike up there looks like trouble. on the ford accesorie web site these 2 cross bars are $485.oo.Is that really the price? I went with the Tork 2" hitch mount and use a hitch rack. SO much easier than raising a bike over the relatively high roof/glass, and vastly better wind resistance and lower profile. And cheaper. 10 minute install for the hitch, the rack just slides in and out when I need it. I'm terrified of a low hanging garage doors when returning after a ride. 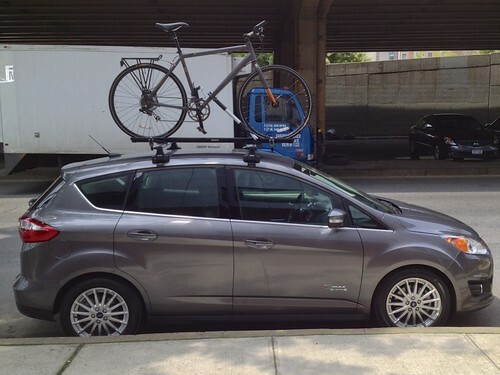 I am a new C-Max owner and looking to add a roof rack for bikes and an occasional cargo box. I have used Yakima Landing Pads in the past and really liked them. It does require drilling into your roof, but provides a sturdy mounting point and is very easy to remove the rack. For the C-Max I am also considering Yakima’s tracks. Same idea but provides some flexibility of moving the mounting points. Would dearly like to install low profile roof rails instead of the available crossbar kits.